The Simmons School of Management (SOM), part of Simmons College, was founded in 1973. A center for innovative teaching, research, and discourse on the topics of women, leadership and management, the school offers a demanding management education to women MBA students. It recently launched two new co-educational programs: a CAMHE-accredited Health Care MBA program and a Master of Science in Management program. The SOM provides executive education, consulting services, and applied research to senior management in business, government, and the nonprofit sector. The school is accredited by the Association to Advance Collegiate Business International (AACSB) and the New England Association of Schools and Colleges. Its MBA program has been ranked No. 1 by the Princeton Review in “Greatest Opportunity for Women” for five consecutive years. Simmons’ academic campus is located near the Back Bay Fens in the Longwood Medical Area of Boston. It is next to the Isabella Stewart Gardner Museum and a short walk to Fenway Park and the Museum of Fine Arts. It is easily accessible by public transportation, and also offers on-campus parking options for students. 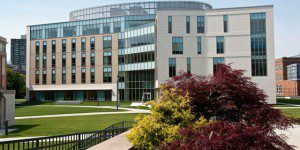 The Simmons School of Management is less than six miles away from Boston’s Logan International Airport. The School of Management is housed in the School of Management and Academic Building, one of five academic buildings on Simmons College’s campus. Built in January 2009, it is LEED Gold-certified, and is among the most environmentally-friendly buildings in Massachusetts. The five-story, 66,500-square-foot facility includes four state-of-the-art general use classrooms, four SOM-specific classrooms, an executive education conference room, and a “green” landscaped roof plaza. High-speed and wireless Internet access is available throughout campus, in addition to multimedia services and an e-learning platform to supplement coursework. Simmons SOM students also have access to Simmons’ centers for academic support, information technology, counseling services, health, and the athletic facilities. Simmons employs over 200 full-time faculty members, around 70 percent of which are female. The Simmons School of Management enrolls more than 4,400 students across all graduate programs. Students represent 40 states and 30 countries. Over 27 percent of the students are of minority status. Students can earn the traditional Simmons Online MBA or a Health Care MBA.